Port Lincoln is a city in South Australia. It is a coastal city on Boston Bay at the southern end of the Eyre Peninsula. It is the largest city in the region. It is about 280 kilometres (straight line – 646 km by road) from the capital city Adelaide. The first people to live in the area were the Barngarla (Parnkalla) people, who are Indigenous Australian people. The name they used to call this area was Galinyala. Europen people settled in the area in 1836. British Royal Navy explorer Matthew Flinders discovered the harbour in February 1802. He named it Port Lincoln rather than just Lincoln, where Flinders came from. Port Lincoln may have become the state capital of the future South Australia, but it did not have a good water supply.[source?]. Even as a small town, Port Lincoln could not get enough fresh water, which is now supplied mostly from the underground aquifers to the south of the city. Recently the water supply on the Eyre Peninsula has been connected to Murray River water through a link from Kimba to Whyalla to connect into the Morgan to Whyalla pipeline water. About 14,245 people live in the Port Lincoln area as of 2006. Aboriginal people made up 5.4% of Port Lincoln's 2006 population. Port Lincoln has different coastal areas, from sheltered waters and beaches, to surf beaches and rugged oceanic coastline. Port Lincoln and its suburbs comprise the City of Port Lincoln local government area. 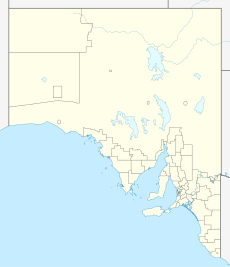 Port Lincoln is in the state electoral district of Flinders and the federal Division of Grey. Tourism is becoming more important, thanks to the scenic beauty and coastal locality. Easy access to both Spencer Gulf and the Great Australian Bight make Port Lincoln a good place for yachting, scuba diving, shark cage diving and game fishing. The city also is the regional centre for government administration, corporate services and commerce to Eyre Peninsula. However, many State Government functions are gradually being closed as State Government becomes more centralised in Adelaide. During the past decade, there has been a big increase in building houses and commercial buildings. Lincoln National Park, Coffin Bay National Park and Kellidie Bay Conservation Park are within easy driving distance. Port Lincoln is the port for the isolated narrow gauge (1067) Eyre Peninsular Railway. Port Lincoln Airport is located a few kilometers north of the city. Regional Express and Qantaslink provide several daily flights to the state capital of Adelaide. Australian Survivor, the Australian-produced series of the US television series, Survivor, was filmed at Whalers Way, south of Port Lincoln, in 2001. Hearts Apart by Caitlin Jones was written on a farm in Port Lincoln. Port Lincoln was visited in 1939 by English travel author Eric Newby, while he was crew in the four-masted barque Moshulu, which anchored off Boston Island. Moshulu had taken 82 days to sail to Port Lincoln from Belfast in ballast (a fast passage for a windjammer). But there was no grain to be had there, even though Moshulu waited at anchor for most of January. The crew was given shore leave in Port Lincoln, encountering large amounts of Australian wine. Moshulu finally sailed to Port Victoria for cargo. During the 1939 season, Passat and Lawhill also went to Port Lincoln. Newby wrote about his round-trip from Ireland to South Australia in his book The Last Grain Race (1956). Several pictures of Port Lincoln in 1939 are in his photo-essay of his voyage, Learning the Ropes. Port Lincoln has two local commercial radio stations, 89.9 Magic FM and 765 AM 5CC. It is also served by ABC West Coast SA on 1485 AM. It also receives Triple J and ABC Radio National from Tumby Bay and satellite uplink from Melbourne respectively. ABC News Radio is available on 91.5FM. It also receives KIXFM 87.6. Port Lincoln has one local newspaper, the Port Lincoln Times, a Rural Press publication. The Port Lincoln Times is published on Tuesdays and Thursdays and is printed in Murray Bridge at the high-tech Rural Press printing centre. Free to air TV stations available in Port Lincoln are ABC, SBS, Southern Cross GTS/BKN (formerly Central Television) and Southern Cross Ten. Also available is Austar pay TV. Olympic gold medal weightlifter Dean Lukin was a tuna fisherman who became famous as a weightlifter in the 1980s. He came back to run the family fishery business. Many Australian Rules Football (AFL) players have come from Port Lincoln, including Graham Johncock, Peter Burgoyne, Shaun Burgoyne and Byron Pickett. Tony Santic, the owner of Makybe Diva (the only horse to win the Melbourne Cup three times), is a tuna farmer in Port Lincoln. A life-sized bronze statue of the horse stands on the town's foreshore. Australian Diamonds netball player Lauren Nourse began her career in Port Lincoln at age seven. In 2008 she was a member of the gold medal winning Australian side at the Auckland World Netball Championships. ↑ "3218.0 – Regional Population Growth, Australia, 2014–15: Population Estimates by Significant Urban Area, 2005 to 2015". Australian Bureau of Statistics. Australian Bureau of Statistics. 30 March 2016. Retrieved 12 September 2016. Estimated resident population, 30 June 2015. ↑ "2011 Census Community Profiles: Port Lincoln". ABS Census. Australian Bureau of Statistics. Retrieved 15 September 2016. ↑ "Eyre Western SA Government region" (PDF). The Government of South Australia. Retrieved 10 October 2014. ↑ 4.0 4.1 "Search result(s) for Port Lincoln LOCB (Record No.SA0040601) with the following layers being selected – "Suburbs and Localities", "Local Government Areas", "Counties" and "Place names (gazetteer)"". Property Location Browser. Government of South Australia. Retrieved 11 December 2016. ↑ "District of Flinders Background Profile". Electoral Commission SA. Retrieved 9 September 2015. ↑ "Federal electoral division of Grey" (PDF). Australian Electoral Commission. Retrieved 24 July 2015. ↑ Here is a quote about the Aboriginal name: "Professor Ghil'ad Zuckermann, Chair of Linguistics and Endangered Languages at the University of Adelaide [...] told NITV: 'I urge Australia to define the 330 Aboriginal languages, most of them sleeping beauties, as the official languages of their region. [Australia should] introduce bilingual signs and thus change the linguistic landscape, of this beautiful country. So, for example, Port Lincoln should also be referred to as Galinyala, which is its original Barngarla name '". These sentences appeared in an article that was written by Sophie Verass from the National Indigenous Television (NITV). The name of the article was Indigenous meanings of Australian town names. It was published on 10 August 2016. This page was last changed on 8 February 2019, at 20:21.